Bengaluru is a city which has far oustripped its original population for which it was designed. From a population of approximately 15 lakhs in the 1970s, to an estimated 110 lakhs today (source: Draft Revised Master Plan 2018), the city’s population has burgeoned beyond limits, and stands at the cusp of further explosive growth to 210 lakh plus by 2031 (the end year of RMP 2031). Transport planning for such a huge population is very important, and cannot depend on piecemeal solutions. That’s where elevated corridors come into picture. From this level, the practitioners of Mass-Transportation cite their oft-expressed desire to move the modal share to a more acceptable level. So if we move from the “Present level” to a “Desired level”, the numbers that even Public Transport activists are talking about is reflected in the Desired Level column of the Modal Share table. But when we apply the percentage levels to the population levels and arrive at absolute numbers then we find ourselves on much shakier ground. For instance, virtually the only modes of Public Transport today are the Bangalore Metropolitan Transport Corporation (BMTC) buses and the Metro. The BMTC ridership is today 45 lakh trips a day and the Metro Phase 1 has a ridership of 4 lacs a day. Private vehicle ridership estimated by working backwards from the Modal shares outlined constitute around 45 lakh trips a day at present. If we do a simple mathematical estimate of Ridership in 2031 = Ridership today x [Modal share in 2031/ Modal share in 2018] x [Population in 2031/ Population in 2018] we find ourselves with the following numbers. Leave aside for a moment the Private Vehicle numbers which by themselves are slated to go up 22 % ! When we analyse the Public Transportation numbers, we come up with the following known non- road modes for Public Transportation by 2031. Metro — Phase 1, 2 and 3 (which in the best case scenario is all that can be completed by 2031) — Ridership 30 lakh. Angry voices aside, Delhi Metro today has a line network greater than Phase 1 and 2 & 3 planned phases combined. And it is not going beyond 26 to 27 lakh rides a day. Commuter Rail: The Commuter Rail projects being planned are supposed to do the equivalent of 25 lakh rides a day. The problem here is that a great percentage of commuter rail rides will involve the last mile being done by some other form of transport (either Public or Private) and much of this will involve road-based transport anyway. Let us be charitable for a minute and assume that by some magical intervention, all users of commuter rail will just walk to their destinations without further demands on the road. Having addressed the modal projections, we should now come to the question of roads. According to the India Mobility Final Report by the Global Mobility Monitor Network, the road density in Bangalore is only 8.2 km per sq km. This is just 1/3 of the road density in say, Delhi. We don’t really need studies to tell us that Bengaluru’s roads are badly clogged. They are bad, as any commuter in the city will tell you. And can anyone argue with a straight face that the existing roads can take 84 % more buses and 22 % more cars and 2-wheelers? Augmentation possibilities exist along the X-Y Space and along the Z axis (Elevated construction or tunnels). 1. Surface level augmentation, such as road widening, is a process marred with multiple problems. For instance it exacts a tremendous price on people whose property is located along the sides of the road, dispossessing them of houses and offices. The prices of property in Bengaluru have also touched levels where the costs are so prohibitive that acquisition of land paying market prices have been virtually ruled out. With prices in excess of 12000 per sft all over the Bengaluru Metro region, acquisition through compensation does not appear to be a feasible approach. The other solution of issuing TDR (Transferable Development Rights) has run its course and has been exposed as an ineffective instrument that does not give any good value to the holder of that piece of paper. This has led to land owners refusing to part with property in exchange for TDR and that in turn has led to court litigation – examples being the recent Sarjapur Road widening proposals which have all been stymied by court stays. 2. Vertical Augmentation – elevated roads and tunnels – are probably the only realistic road augmentation proposal still left. The costs of these road augmentation proposals by elevated structures although steep at Rs 150 crore a kilometre offer the city its best chance to augment capacity. The cost is not going to get any cheaper and there is a real danger that policy paralysis will lead to the cost ballooning further in the form of steep escalations if nothing is done. The Commissars of the Anti-Elevated Road movement have aimed a series of arguments over the years at the elevated roads, some contradictory to each other. Some of them are addressed here. They do not work/ elevated roads result in no benefit in travelling time compared to staying on the grade: There is a serious problem with that argument. It just isn’t true. There are real savings in time for projects like the Electronic City Elevated Expressway where the time saving is between 20 minutes to a half hour each way. It is even higher for instance in a foreign location like Bangkok where the morning commutes between downtown Bangkok to for example Don Muang Airport with or without the elevated expressway system amount to almost an hour difference in time. Consider for a moment the absurdity of this argument. There are people queuing up daily to pay toll at the Electronic City Tollgate. They won’t be paying unless they are seeing a benefit, right? It’s a waste of money: This is the argument designed to cater to middle class sensibilities – it costs Rs 150 crore a kilometre. Guess what, let’s count what the benefits are to a commuter. Let’s take an IT professional commuting to Electronic City. She saves 45 minutes a day. She commutes 250 days a year. So that translates into 187 hours a year saved. A techie getting Rs 1 lakh a month is worth Rs 600 per hour on a flat calculation basis. Her time saved in a year is worth Rs 1.12 lacs per year. Multiply by the huge number of people using it. Isn’t that a huge economic boost ? What is the value of that time ? And many of these elevated roads will be tolled and so the real cost isn’t anywhere near the Rs 150 crore a km people are talking about either. a) Taking private vehicles or public long distance vehicles off the roads frees up space for public transport on the grade level. b) The space freed up can be used to provide NMT facilities including cycling tracks. Multi-modal doesn’t mean that every investment should be multi-modal. It only means that the basket of investments in transport should be multi-modal (just as it is absurd to state that just because your diet should be balanced, you should balance every mouthful). It is ‘elitist’: You will know that someone has lost an argument when the class warfare argument is pulled out. This is patently absurd. For one, the users of these elevated expressways are paying for their usage explicitly through tolls and implicitly through high vehicle taxes collected by the government. The taxes being paid are being used to fund, among other things, subsidised public transport. ‘Transport people not vehicles’ aka people per km per crore invested: Much popular among the arguments arsenal, this trots out an ad-hoc metric vide which if applied logically, all airports would need to be closed down, all upper class bogies in the railways need to be shut, air conditioned buses need to be retired etc. That policy died long back everywhere else, but it looks like making a comeback here in Namma Bengaluru. ‘Induced Demand’ theory: The “Induced Demand” theory holds that putting up nice shiny infrastructure results in an increase in traffic that will fill the infrastructure so created. There are several problems with that logic too. a) First, let us start from the fact that induced demand itself is a concept that has not been borne out universally by studies. Some impact has been found in some and very little impact in others. b) Second, this concept has been pulled in from foreign cities where the populations have stabilised and therefore it is possible to have a direct correlation between traffic increase and infrastructure addition. In our city, population growth is galloping. There will be a huge increase in traffic anyway with or without any induced demand in the equation. c) The logic of exploding populations dictate that there will be an explosive growth of traffic too, How much is population induced, how much is prosperity induced and how much is infrastructure induced is not a question that can easily be answered. “Sustainability” is the mantra invoked finally as the Brahmastra when all else fails. What exactly is sustainable about trying to pack more and more traffic into the same roads? What is sustainable about pretending a problem doesn’t exist? What is sustainable about talking about pollution but not recognising that automotive pollution from idling vehicles is the highest contributor? One can object to the way the government has been undertaking certain projects. But the concept itself is however one that should receive a cautious welcome. Note: The opinion expressed in this article is author’s own. Nitin Seshadri is a resident of Koramangala. Catch up on all that you may have missed last week: Bengaluru has a new Mayor, Good Samaritans now have law on their side, and a sudden spurt of H1N1 in the air. The elevated corridor merely solves traffic problem for some parts for less that 5 years, that too assuming the project itself can be completed in 2 years. Metro upto bommasandra should be extended to attibele and hosur.This line will pass through the bangalore salem railway line. This will be an excellent interchange by planning another indian railway train halt near chandapura busstand . Our cm has cut this proposal .We people have to get this proposal again as it will save a lot of fuel and will bring down pollution. I am sure suburban rail can add more capacity. Quadrapling of line beyond city limits and dedicated elevated tracks within city limits should be the most feasible option. It would be interesting to see if natives of towns around Bangalore actually go back to their home towns. Suburban rail needs to be supplemented with creation of jobs in towns like Tumkur and Kolar not to mention social infrastructure like Hospitals and Schools. A study has also mooted for Trams in commuter towns. An effort to build suburban rail infrastructure without complementing it with efforts in other directions will be a financial and economic disaster. The suburban rail system should also look at monetizing revenue through rentals, parking and advertising to be able to subsidize public transport. Elevated roads serve no great economic benefit in terms of decentralized economic growth. The profits of oil and automobile companies shall swell. The property required to be acquired and the construction period has huge implications in terms of loss of business. If somebody does some primary research and speaks to business establishments in the close vicinity of construction sites, shall give us a ball park figure in terms of lost sales. I am surprised that BCM does not seem to be keen to get to the bottom and do some research around this. The total length of the elevated flyover is 95 kilometres. The construction given BDA and BBMP’s track record could go on for 10 years. By then, Bangalore will be completely unlivable. We can then enjoy the ride on these fancy elevated roads in a ghost city. 33000 crores just to help the four wheeler riders (Most of Single user Cars). As you start the sentence..its daily commuting we are talking of..and for sure anyone in the world will vouch for the need for a comfortable, timely and stress free travel..and only PT like metro can provide that.. In EC case, the BETL is in a financial mess already and it will sure get worse for them once the metro lines are commissioned there.. So elevated road corridors are indeed a waste of money in every sense! This is what happens when u chase and interpret numbers towards an already established opinion, rather then let numbers decide the way to go. More interesting is that some people interpret numbers the way they want to explode it hugely to argue that elevated roads are the only way out. With due respect to them, there are more healthier ways to meet travel demands, whatever they might be, than through elevated roads. That those in favour of at least considering road infrastructure expansion / corridors, don’t want investment in public transport/su ur an rail.!! These are not mutually exclusive. And readers here might be surprised that some of the biggest advocacy for public transport/nmt comes from the so called “pro corridor lobby”.!!! Absolute numbers for private transport have increased to this level only because of unrestricted road expansion that has made BMTC, one of the best RTCs, struggling to move their buses in atrocious traffic conditions, thanks to demands for more & more roads & govt pandering IT companies & car lobbies. Exclusive track rail systems (metro & suburban) are the only answer as is a total clampdown on further road expansion. People are waiting to get off motorbikes, cars & buses & hop on to metro /suburban due to the havoc caused by street space consuming single-occupier cars, making road based public transport highly inefficient. This has in turn, forced people to take even more to private vehicles. Your assumption that private vehicles will also keep growing & so, we also need more roads while stating in principle that you are not against public transport development as is Nitin’s is flawed & unrepresentative of the current situation. This is more of the lip service to justify the ask for elevated roads rather than any genuine concern for the city. Population increase is some 46% in ten years (@ 3.9% annual increase). But traffic has increased in gigantic proportions & has doubled, only because of road expansions in the first place. A nominal increase with population growth & income increases could never have doubled vehicle numbers in just 10 years. What we need is a serious & substantive reduction of mode share by cars /2-wheelers that are destroying the city. So, I am of the opinion that there should be no further road expansion until metro phases 2 & 3 are done fully as also a suburban rail system & a further assessment is carried out at that stage, not before. Sorry, but this is the only solution. Those addicted to cars have had their time. 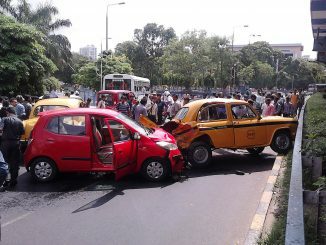 They now need to accept this stark reality & place the city ahead of their beloved cars for the next couple of decades. If their commutes get delayed, so be it – the whole city is experiencing the same, & will continue until the powers that be accept that primacy for public transport, especially mass transits on exclusive right of ways is the only solution, not elevated roads. At best, BMTC is a non-party to this traffic jam improvement drive, because they are so much disconnected from the public they are supposed to serve. It is unfortunate that the arguments have degraded to name-calling. Why don’t we recognize that urban transport is a “wicked problem”, and use the right tool (IBIS, using Compendium) to find some solutions? As regards the data, I have serious doubt how that was derived. We should have access to the data and how it was interpreted. Next issue is how we interpret the data. In many stretches the overload is by a factor of 5 even at present. Mere doubling of capacity will make no difference even for today’s traffic. For the network to work, all links must be free of jams, otherwise the pileup spreads in other links. So are we planning to build a multi-layer highway, like a Lego toy?? Secondly, none of the govt agencies are serious about this situation. BBMP has allowed “gated communities” to encroach on public roads. BDA and KIADB never plan for through roads through large properties to meet the road density criteria. Traffic police does not keep the roads clear of “temporary” parking, which means huge loss of carrying capacity. New properties are required to get NOCs, but no attention is paid to traffic impact and mitigation. If cycling lane are added to major roads, the overall capacity would drastically reduce. Biking is more appropriate for the last mile connectivity. But BBMP has never tried to carry bicycles on their Volvos, while their much-hyped wheelchair facility is hardly used. (It would be far cheaper if BMTC provides small vans for wheelchair-bound people on Volvo routes, and increase the capacity of the Volvo fleet.) The much hyped ITS is a farce, and does not contribute in attracting people to a bus ride (name ONE benefit). BMTC runs empty Volvos for IT parks that are located on regular Volvo routes. BMTC does not plan for the last mile connectivity at all. Intermodal coordination is totally absent, because they even report to different ministers. BDA+BBMP have planned their traffic hubs away from the actual job/residential hubs. Thus their implementation of the famed “hub-and-spoke” model only adds to traffic jams. These is only the tip of the iceberg. There are many such issues. Without addressing the fundamental issues, we cannot hope that adding a deck will solve the issue. Before committing great amount of money, we should implement the other measures first. As per the RTO, the number of vehicle registered in Bangalore has doubled in the last 10 years. If the same trend continues, even doubling the road surface on all roads will still lead to the same traffic situation. Shouldn’t the govt expenditure with public funds for transport be proportional to the benefit the solution offers? If there is 20,000 CR invested on elevated roads which still won’t solve the problem there should be a plan to invest similar amounts on other solutions as well. Or perhaps the elevated roads could be fully privately funded with tolls accounting for the cost of construction, operation, leasing of public spaces and increased pollution. Closed door meetings with experts are non productive. So talk to the common man on the road rather than talking to person who sits in Air conditioned office. You are wrong in several of your assumptions.First the Electronic City elevated expressway, the grade surface below.etc.are.traversed by me virtually every day for the past 25.years. So I write from experience too. I spent 2 decades of my life in Chennai and know the public transport system there very well (I used that for years too !) There are huge differences including that Chennai expansion has been cut off in 2 directions East and North due to Geography. Also blr growth has exploded way beyond Chennai’s. The British invested in rail facilities of Madras which was a presidency town. That legacy still stays. In spite of that Chennai roads are frequently as congested as Bangalore. Lastly I have tabled hard numbers. Class war attacks calling me an elitist etc are of little use. The numbers are from DULT and BDA. Sources are cited. Refute the arithmetic. I have no intention of getting into labels like elitist etc. This is a highly flawed analysis & appears purely to build up a case for needless elevated roads. Primary arguments are based on erroneous data to support the demand. Further, the arguments ignore RMP’s principal hypothesis which is to emphasize pre-eminence of public transport & NMT in line with National Urban Transport Policy. The number of daily trips is about 10 million (100 lakhs) for 11 million population, or 0.9 per capita (RMP2031-Final, pg.17). The basic assumption that city presently has 144 lakh trips is therefore incorrect. The target set by RMP2031 for public transport is 70%, not 50% (Pg.18). Population estimated for 2031 is 19 to 20 million (pg.12). Going by the same ratio, estimated daily trips in 2031 would be 20 x 0.9 = 18 million, or 180 lakhs. 70% of RMP target would be 126 lakhs (not the hugely exaggerated 276 lakhs as stated above). Another fallacy is that since Delhi metro has less than 3 million ridership, Bangalore cannot have as much! The fact is that Delhi has low metro ridership because its road network was simultaneously expanded with several expressways, flyovers, road improvements etc. In short, Delhi is an example of how a city’s transport planning has gone horribly wrong resulting in the present pollution & heavy congestion levels despite a far superior road network. There are examples of cities that have built up huge metro riderships in a short span. Guangzhou in China, for example has a population of just 150 lakhs with a daily metro ridership of 76 lakhs (in 2017). Total: 50.49 lakhs (Length – 42.3+72.5+17+29 = 160.8km). No data is available on Ph3 that is likely to add about 100km. Going by average projected capacities as above, per km capacity is on average about 31,400 per day. The corresponding figure with actual ridership-per-km of Hong Kong metro is 27,712 (in 2017). There are systems with far higher ridership-per-km numbers (Tokyo, Cairo, Budapest, Sao paulo etc). Assuming BMRC adds 100km in Ph-3, metro’s capacity would rise by about 31400 x 100 = 31.4 lakhs, making it a total of about 82 lakhs. Assuming 70% capacity utilization, ridership would be close to 57.4 lakhs. Current number of private trips are on the high side (52% or 52 lakhs). Bringing it down to a reasonable number should be the objective, not cater to even more! It is typical of a particular lobby that even when an error in the face of record is pointed out they plough on nonetheless. RMP 2031 refers to ridership numbers and modal shares of motorized trips only. So there is really no big disconnect between the 100 lac trips listed in RMP and my 94 lac trips based on DULT. Same applies for the 2031 data. RMP applied a 70 % share of public transport within the motorized trips space. Given the NMT share assumed by me is 30 % compared to 35 % today there isn’t really much of a dksconnect. We are talking 70 % of the remaining 70 % motorized trips on public transportation. Would like to remind my esteemed friends that 70 % of 70 % is 49 % whereas I have assumed 50 % overall modal share. It is highly distressing that in spite of explicitly pointing out that you have culled out wrong figures from RMP this continues to be not called out. As for Metro ridership anyone who believes that Metro can deliver 70 % actual ridership is really super optimistic. Given that this ridership is total including non rush hours etc. I prefer to benchmark from an actual Indian city with comparable track lines. That can be an argument to discuss. But don’t manipulate wrong data , misinterpret the RMP and refuse to correct when the obvious error is pointed out. RMP-Final is not incorrect with its estimate of 0.9 (this includes NMT). Please look up CTTP-2011 & the preceding CTTP-2007. Both are well aligned with RMP estimates. CTTP-2011 estimates 2025 pop at 112.21 & trips at 111.07 (0.98). CTTP-2007 estimates 2025 pop at 122.52 & trips at 127 lakhs (1.04). The estimation of total trips (including NMT) of 276 lakhs for population of 19-20 million is at a ratio of 1.38 which seems exaggerated & is unlikely. Further, irrespective of population or trip numbers, the emphasis on road infra to meet demands is principally a wrong strategy as it contradicts RMP as well as NUTP & also internationally accepted norms to promote public transport & walk & bicycle friendly measures. Why just 70%? Mumbai’s suburban system is delivering perhaps 2-300% more than capacity. Kolkata & Chennai’s suburban systems are delivering equally high proportions of capacity. Agreed these sort of over-crowded systems are undesirable but its very much possible to deliver very large capacity utilization of systems. Many metro systems abroad deliver far above their capacity as well. Examples have been quoted. It is only Delhi metro that is the laggard. Not because the system is bad, but because of the very same set of demands & pandering to car lobbies that has resulted in massive road expansions. Delhi thus stands out as the lone city held hostage by car lobbies. Do we allow Bangalore to go the same way? I wouldn’t even though I have cars at my disposal. I don’t see why others can’t do the same. @citizen matters, why do you always end up being a propaganda tool for destructive folks?? 😀 Don’t you ever worry about your own reputation?? I was coming to that. The Pro Corridor Lobbyists have the ears and eyes of the Emperors, Kings and Vassals. It is very typical of the Koramanagala brigade to come up with such sophistry to justify such ill planned and ill designed projects. It is quite obvious that the author has not traveled on the BETL flyover and has not had a taste of the jams on that road. If this is not classism or elitism what is this? The author would do well to read the second article. A more sustainable solution to this entire traffic menace is to promote decentralized growth in Karnataka. Suburban rail would definitely create alternate places of economic activity. A beginning is being made in Kolar, Tumkur and other nearby towns. I personally know a lot of people who have relocated to Bangalore from nearby towns because of the commuting issues. There could be reverse migration if at all the suburban rail happens. The Koramangala lobby is seemingly opposed to the idea of suburban rail as they feel, the coaches are not befitting for the Bourgeois class of Bangalore. I have even heard remarks that people batting for suburban rail are spewing impracticality. Towns like Dusseldorf in Germany have a lot more buses than Indian cities do. Bangalore has the highest number of buses in India. Ordering a 10,000 buses and integrating it with Metro, KSRTC and even the skeletal suburban system would go a long way in reducing the congestion on city roads not to mention the fact that our denizens would breathe fresh air. 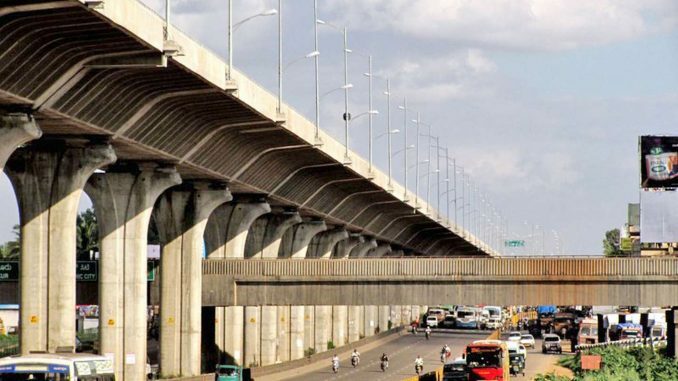 The author should visit neighboring Chennai and see for himself how well connected MRTS, Suburban and Metro systems are. Buses are available at odd hours and provide last mile connectivity. The airport is connected via Metro and even the old suburban link. We are still debating on needless elevated roads here. Even, the flyover leading to the airport gets jammed at times. GOK should stop mollycoddling the Kora lobby, which contributes to the growth of the automotive sector in India.